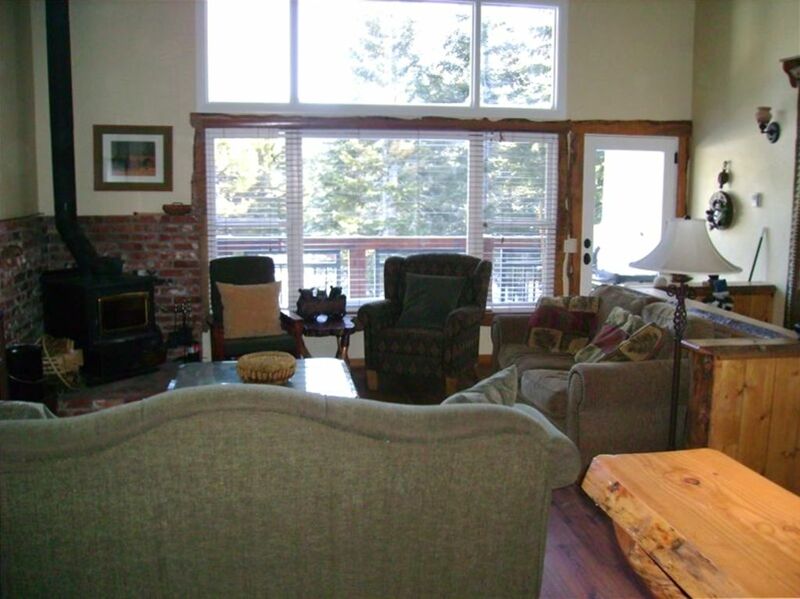 Mammoth Condo Close to Village - Great Location ! This incredible, three bedroom, three bath condominium is located in the Chateau D’oex complex on the private Hidden Valley loop. Quiet and wooded Hidden Valley Road is only a quick ten minute walk to the Village (and convenient Village Gondola to skip the shuttle crowds in the winter) and right next to the fifth tee at Sierra Star Golf Course. Beautiful kitchen with modern appliances including a microwave oven and dishwasher. The kitchen, dining room and living room combine for a fabulous upstairs great room where everybody can hang out together. This spectacular condominium sleeps six with privacy, (nine if you include the queen sleeper sofa in the living room) with huge king beds in the master bedroom and downstairs bedroom. The upstairs bedroom has a queen bed. The master bedroom has a private attached bathroom with extra long bathtub/shower combo. All bedrooms have TV’s. Mountain cabin decor throughout. Very comfortable living room with a 60 INCH wall mounted LCD flat screen TV with home theater sound, wood burning fireplace, both local cable TV and DISH Network Satellite with DVR (we have every premium channel DISH Network offers.. HBO, Showtime, Cinemax, Starz, and so on ..) and DVD-Blu Ray player and a well stocked DVD / Blu Ray movie collection. MBR also has a 42' wall mounted LCD TV w/ DVD player. Amenities include; heated spa and sauna right outside the front door, outdoor stainless gas barbecue on the balcony, interior washer and dryer, wireless high speed internet, close front of unit parking. We also have a large private spot for an RV, boat trailers, or other oversized vehicle and close enough to run a long power extension cord. In the SUMMER & FALL, experience world class lake and river fishing, play golf at one of the scenic mountain golf courses including Sierra Star which neighbors the property, hit balls at the driving range or go horseback riding. Take a quick walk to Mammoth Creek and enjoy scenic Creek and Mountain views or get on your bikes and enjoy miles of scenic trails or world class Mt Biking. Take an adventure to nearby: Mammoth Hot Springs, Yosemite (40 minute drive), Rainbow Falls and Devils Postpile or John Muir Wilderness Park. Walk to the Mammoth Community Park and let your kids play on the multiple play gym sets and swings. The Fall colors are awesome in the eastern Sierra. In the WINTER, experience world class skiing and snowboarding at Mammoth Mountain Ski Resort, ice skating, snowmobiling, cross country skiing, sledding and much more. Book your Winter vacations NOW to guarantee your desired winter dates. Alaska Airlines/Horizon Air has direct flights to Mammoth Airport from Los Angeles (LAX), Reno, San Francisco, San Diego, John Wayne (Orange County) and San Jose with 1 stop service to Seattle and Portland. Go to Alaska and/or United Airlines website for more information.) Early booking discounts available now. Year round, Mammoth has it all! WE REQUIRE A FRIDAY/SATURDAY NIGHT STAY FOR ALL WINTER WEEKENDS. NO CHECK IN ON SATURDAY ALLOWED. I was born and raised in North San Diego County. Attended San Diego State and California State University, San Marcos and received a Bachelors degree in Business Administration. I work for a Fortune 100 company and my wife, son and I still live in North San Diego County (Carlsbad, CA.) I absolutely love the outdoors and especially the Sierra Nevada. There is a lifetime of exploring to do and I plan on seeing as much of it as I can with Mammoth Lakes as my base camp. My love for Mammoth started with the winter but now I love all the seasons equally. I am an avid backcountry skier, snowboarder, hiker and mountain biker. Our family has been going to Mammoth since I was in high school and I have always dreamed of owning a place in Mammoth. This is our first year renting our place and so far the VRBO clientele we have rented to have been absolutely great. We were lucky to find this condo on the beautiful Hidden Valley Rd. loop. Our condo is located on Hidden Valley Rd. which is a quiet & secluded area with very little traffic yet we are walking distance to the Village and Whiskey Creek. Hidden Valley Rd. residents & guests are also a very short walk to Blusapulooza, the Jazz and Wine festivals and other concert events that our held in the neighboring wooded area (Sam's Woodsite) just east of our condo on Minaret Rd. High thread count sheets on all beds. DISH Network with high definition package + Music Channels. We also have local cable TV with over 80 channels with local network channels from Sacramento, many also in high definition. A great (and large) DVD collection of Action, Comedy, Family (kids) and Suspense films. Great views of the Sherwin Mtn. peaks from here. We put 4 chairs out here for sitting and relaxing. This place is perfect for larger groups, and is located walking distance from the village, which is good for the nightlife or just tromping around. The large couch portion of the fold out bed needs a little love, as the vinyl is peeling quite a bit. The washer makes some pretty gnarly noise, but still works just fine. Don’t be alarmed. The spa, sauna, size, and location out weigh those two small issues. The movie selection is impeccable as well. A lil larger water heater would be nice, but hey just plan out the showers accordingly. The place is spacious and close to village. It has three full bedrooms and large gathering area on second floor. Rustic/mountain feel throughout, which fits into surrounding area. Has all amenities, including sleds, humidifiers, etc...Carlos is very responsive and attentive. Will return! Great mountain cabin feel. Everything was clean and well taken care of. This was a very nice meeting place for my family. Next time we are in Mammoth we would stay at this unit again. Carlos was helpful and friendly when we had any questions. We enjoyed the condo and location. There were no problems with the facility. A note for the owner: the liquor cabinet was unlocked. This property was ideal for my family. There was snow right outside the door where the kids could play and it was very close to The Village. Carlos was very nice and quick to respond to any emails. It was the perfect home away from home! Was a nice cozy home stay, everything was great and all amenities were provided. However staying with a lot of people increased the rate of hot water running out for the showers. Other than that everything was great. - Early Dec Special: For a stay of 4 or more nights, rate is $150 mid week and $225 weekend - Last minute discounts for available dates within 72 hrs of arrival.